Websites enable you and your art to be found online. Younger artists are now much more web aware. They might prefer a blog or Tumblr site to start with. Check out my blog post about The Websites of Contemporary Painters in the UK. This contains my observations made about the current status and state of play of artists' websites in the UK. Plus this is my update - Artists websites in 2018 - about what has changed and what has not - and what needs to change! It looks at: the plus points, the design, the words, the weaknesses and the faults. Your website provides information about your credibility and authenticity. Include current information about galleries and/or exhibitions - and people know where to go to see your art 'face to face'. BUT you still MUST be active in marketing yourself and your art. "Build it and they will come" concepts of websites were debunked a long time ago. Just creating a website will NOT generate traffic! Websites stand or fall by their DESIGN AND FUNCTIONALITY as well as their content. Websites can impress if they work well. Speed is increasingly important as a factor determining how websites rank in Google. Some websites load very fast while some are very slow. This often depends on whether both code and image file sizes have been optimised for fast loading. You can check out the speed of your site - and how to improve it - using Google's PageSpeed Tools. Browsing is increasingly done via mobile devices. A website is not fully functional if it cannot be viewed on a tablet or a smartphone. The emphasis is now on websites which can be viewed on any device of any size. People linger longer on websites which make it easy to see the images. Some websites display good sized images of artwork which load fast. I can't think of a faster way to lose visitors than to make people review artwork one by one in the order determined by the artist. Flash does NOT help to impress. Not all artists are aware that the iPad does not support Flash. Hence any website that uses Flash cannot be browsed via an iPad. Your Art Business Name Matters! Check out what happens when you search the internet for your name. Having an unusual name means less difficulty in finding you - if people know how to spell it! Having a very common name can mean you will remain anonymous and unknown on the internet. You need a website domain name which ends in 'art' or 'artist' or 'fine art' or 'painting'. Having the same name as a famous person causes confusion. Consider how best to highlight how you are different from the famous musician/sportsman/politician/actor etc. Try using initials or use a different professional artist name for 'trading purposes'. Banks require a trading name. Check with your bank about what documentation they require if you trade in a name different to your own and maintain a bank account in that name. It's all in the domain name! This is about: (1) How to make a website domain name work for you as an artist and (2) One reason why your artist's website is NOT found on the first page of Google when people look for it. How to have an impact on the Internet! Make sure you use the opportunity for some free publicity to raise your profile via your website. You place an image of the chosen work in a pretty prominent place on your website - and then highlight this using the name of the competition. You'll find that one action will generate traffic. You use the same name for the competition and your website - it makes it a lot easier to find you! 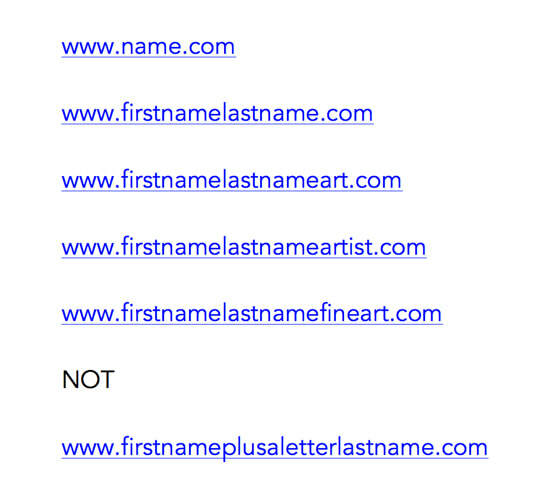 your name - it's absolutely amazing how many artists' websites never reveal the name of the artist! Your biographical information - this should identify what is unique about you (eg where you live and/or have your studio). an image of youpersonalises a website and makes it more friendly to viewers. It doesn't have to be a "studio portrait".